One of the most common questions our service advisors hear is “what is a tune-up?” The term “tune-up” is an old one. It originated when cars used mechanical intake and timing systems to maintain the proper mixture of air and fuel. They often needed “tuning” to stay running smooth and cleanly. Nowadays, all vehicles have forgone carburetors for much more efficient and reliable computer-controlled injections systems and variable valve timing. So instead of physically tuning your engine for optimal performance, our technicians connect a diagnostic computer to your car’s OBDII system to find out where any problems are appearing. This will often appear as a Check Engine or Service Soon light on your dash. 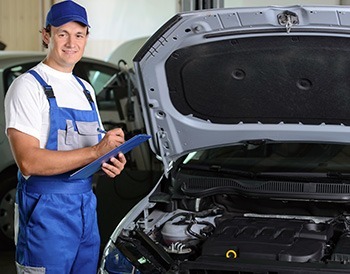 To get the check engine light assessed on your car, truck, or SUV, please call our Mississauga car dealership service team at 1-888-651-1987 or book online using our handy online form. When a check engine light appears in your gauge cluster, it could mean many different things. It could be as simple as needing to tighten your gas cap all the way to serious emissions sensor maintenance. Regardless, it’s important to schedule an appointment at 401 Dixie Kia as soon as it’s convenient to get that warning light looked after. In order for your engine to run properly, the ignition system needs to send electrical power to your spark plugs, which must fire strongly and consistently. Over time, carbon can build up around the electrodes, causing it to misfire or fire not as strongly, giving you worsened power and fuel economy. Your car’s fuel injectors are responsible for starting and stopping the flow of fuel to the combustion chambers. Should your fuel injectors become clogged with carbon, gum, varnish, or dirt, it will impede them from delivering the optimal fuel to air mixture. Properly maintaining your fuel injectors will ensure that you’re always able to ring out the best acceleration and gas mileage. If your vehicle uses a timing belt system (as opposed to a timing chain, which typically doesn’t need replacing), you will eventually have to replace it with a new one. Though it’s best to refer to your individual model owner’s manual, most timing belts require service around the 100,000 km mark. The trouble with timing belts is that they don’t show wear like other belts, meaning it’s a ticking time bomb for failure (and potentially expensive repairs) once you pass the recommended service interval.